Spaetzles are soft dumplings that are as simple to make as pancake batter. 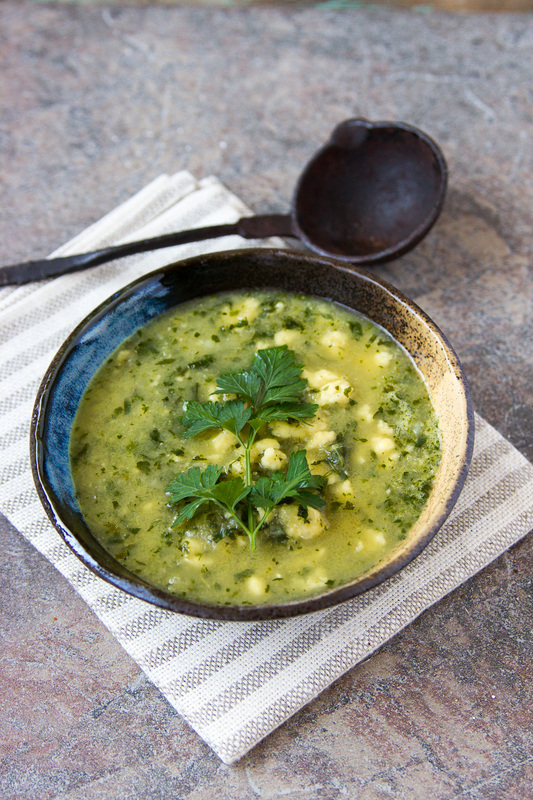 They add additional flavor and texture to this soup. The batter is mixed together by hand, then pressed through the holes of a colander into boiling water to cook for a minute or two. Traditionally they are then pan fried in a little butter to brown and crisp, but I omitted this step. Heat the oil in a large saucepan. Add the onions and cook for about 5 minutes without browning. Add the garlic and potato and cook 5 minutes more. If the mixture starts sticking to the pan, add a tablespoon of stock to loosen. Add the watercress, parsley, stock, sugar, salt and pepper. Bring to a boil, remove from heat, and puree using either an immersion blender or standard blender. Set aside while you make the spaetzles. Note - I found this wonderful hand made ricotta cheese at Whole Foods Or if you prefer to make your own, click here. To make the spaetzles, mix the flour with 1/2 t. salt and a few grinds of pepper. In another bowl, whisk together the eggs, milk, ricotta, garlic, parmesan, and allspice. Mix in the flour until the mixture is uniform and the consistency of a thick pancake batter. Add a bit more milk if necessary. Bring a large pan of water to a boil and place a colander on top. Spoon the spaetzle mixture into the colander and using the back of a spoon, push it through the holes into the simmering water. Blanch for a minute, until they rise to the surface, lift out with a slotted spoon, and transfer to the pot of soup. Or if you prefer a crispier spaetzle, pan fry with a little butter until lightly browned.